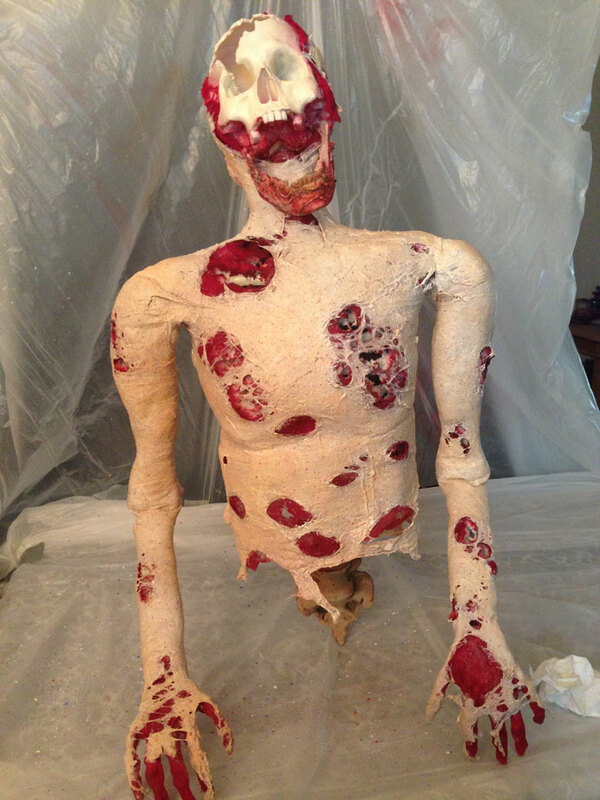 A few years ago I was tasked with constructing a zombie torso rod puppet for a film project. Because we had to deliver on a short turnaround with no budget this is far from the best quality work, butI wanted to share it here because it's a good example of what you can make with leftovers from other projects and very little time. (easily done in a single day) I do have to add a disclaimer on the character design and paint job. 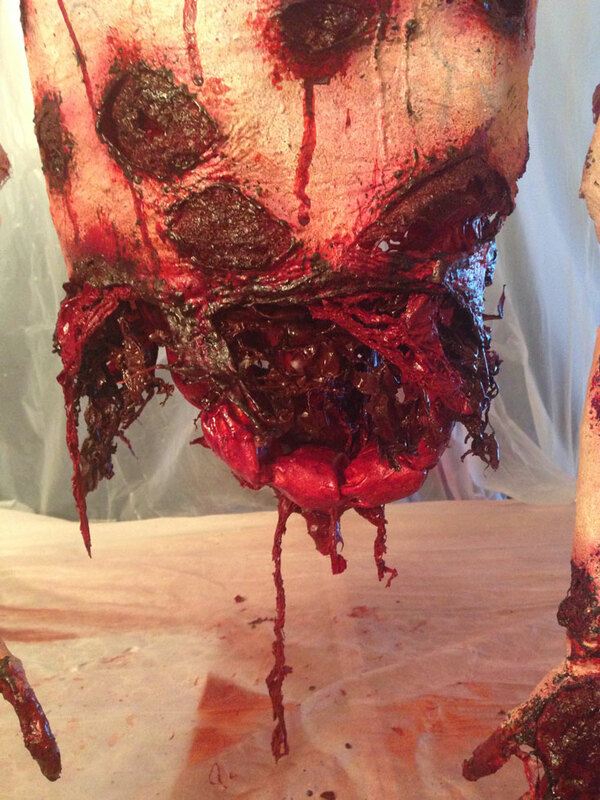 The character in the project was a pale skinned, bald, and earless mutant zombie who had been hit with grenade shrapnel. (Not the fleshy rotting kind of zombie we all know and love) We were a late addition to the production team so we had no input on character design, and no time to properly paint this guy, but that's how things go! Thankfully atmospheric fog and dim lighting can hide a lot of our crimes. 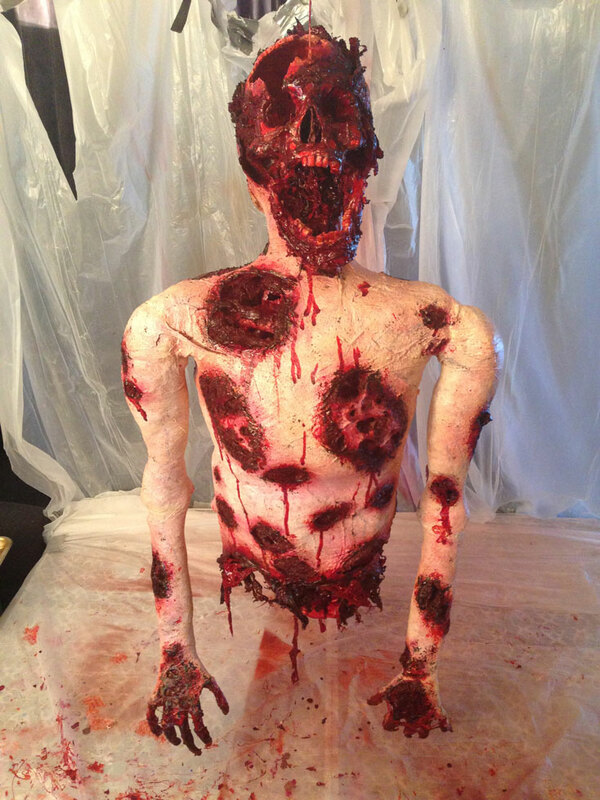 Too bad Gary Tunnicliffe's amazing corpsing lesson had not been released yet, or I would have tried some of his methods! This is more of an overview of the creation process than a tutorial, so please feel free to post any questions below. Many of these items can be found in your local art store, hardware store, or on the internet. This was pretty much all stuff I had laying around the shop. We designed a custom mechanism to allow the skull free motion in 2 axis (pitch and yaw) using a hinge at the base and a rotating bearing between the hinge and the skull. This mechanism was attached to the skull and skeleton using screws and epoxy. 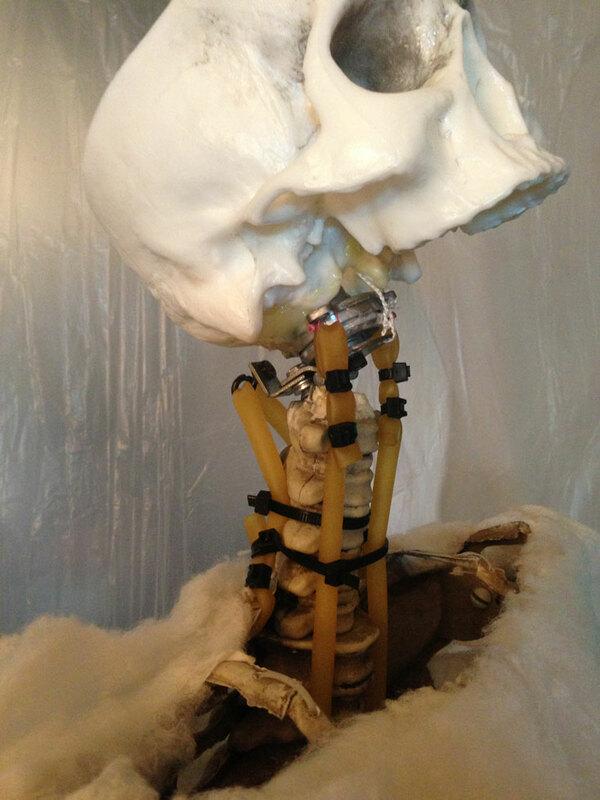 To provide some resistance and create more natural movement we attached latex tubing to the skull so its resting position was centered and level. 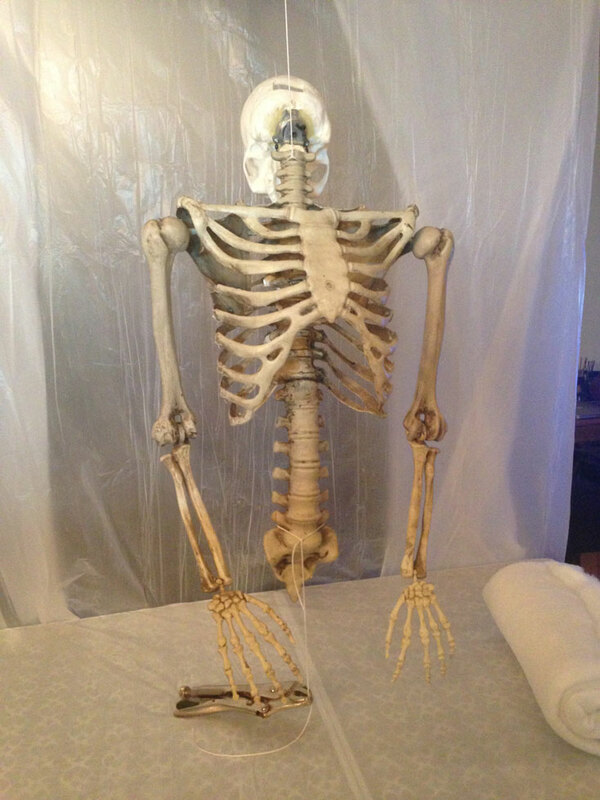 Using 77 adhesive spray we applied layers of synthetic batting to the skeleton to create muscles. Vinyl tubing with an inner diameter that matched our puppeteering rods was then attached to the forearms at the elbow joint. The outside of the vinyl tubing was then lined with flexible metal wire so the attachment point could be bent into different positions to allow the puppeteers more freedom when positioning the puppet on set. Using an airbrush we gave the batting a red base coat. A rotary tool was then used to carve open the skull. The jaw was also attached so it could swing freely as if dislocated. Acrylic denture teeth were also applied during this step. The entire puppet was then wrapped in cellophane. Heavier plastic drop clothes can also be used for this skinning method, but we chose to go with several layers of thinner cellophane to get a slightly different effect and added flexibility. To make the wrapping process easier in tighter spots we used a hack saw to cut the roll of cellophane into multiple narrow rolls. This step was by far the most fun. 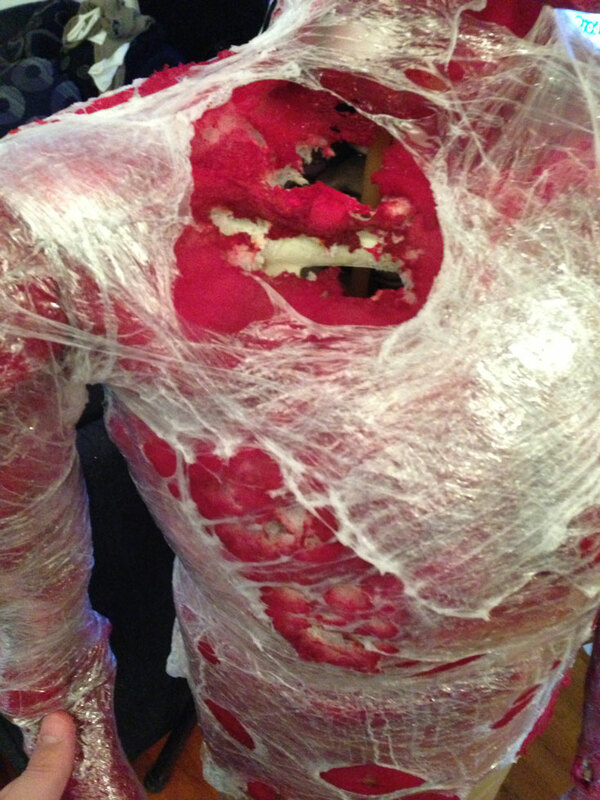 Using a heat gun we tightened up all the plastic wrap, creating a uniform skin surface. In some areas we melted through the plastic wrap reveling muscle tissue, and in others we melted all the way through the synthetic batting to revel bone. If natural cotton batting (which does not melt) were used we would have been unable to create the deeper wounds with the heat gun alone. 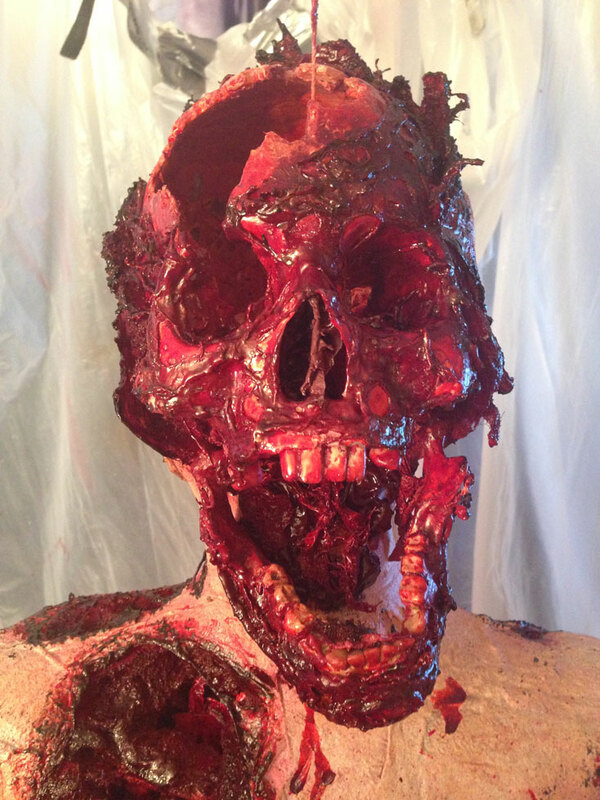 We applied layers of pigmented liquid latex over the plastic wrap to create the outer skin, leaving the wounds (including the shiny plastic wrap) exposed. 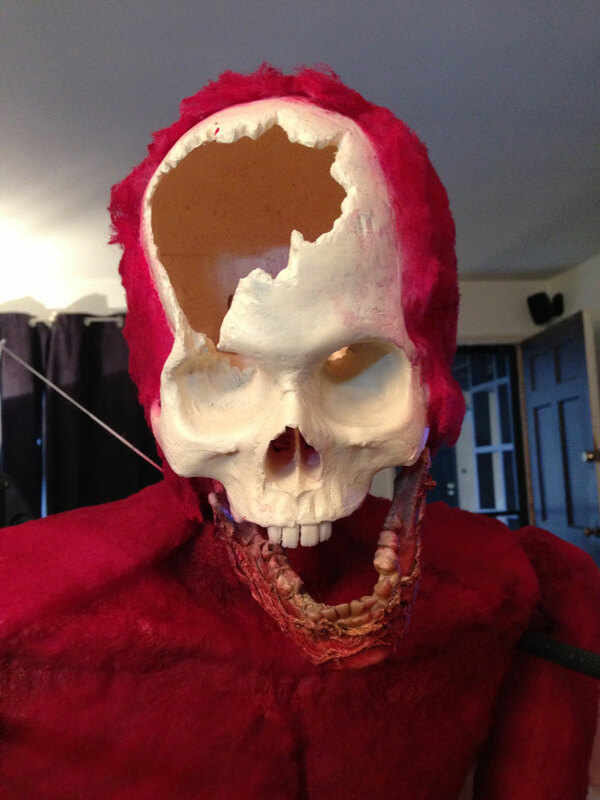 We applied red pigmented latex to the skull and rolled portions of it back to reveal bone and create a fleshy texture. 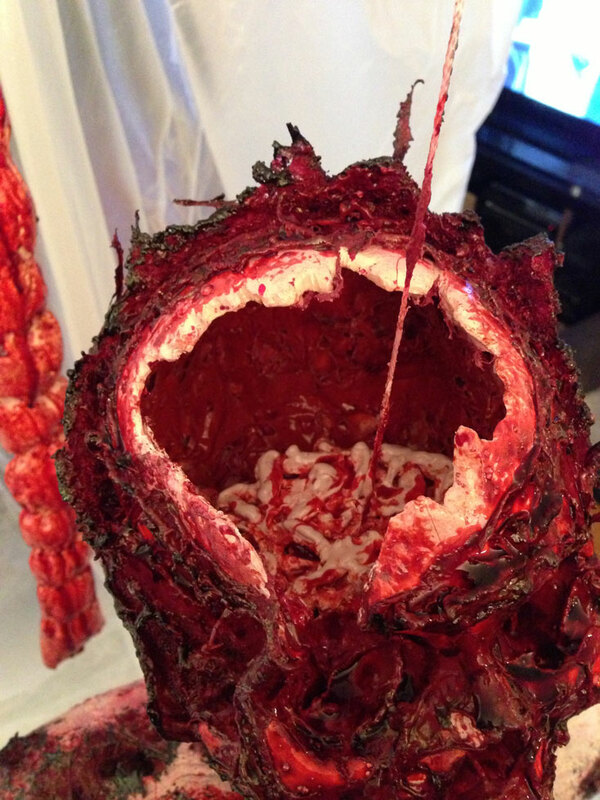 To create chunks of damaged brain matter we rolled small pieces of cotton into 1-3″ worms and coated them with pigmented liquid latex. Many layers of these were built up over time. 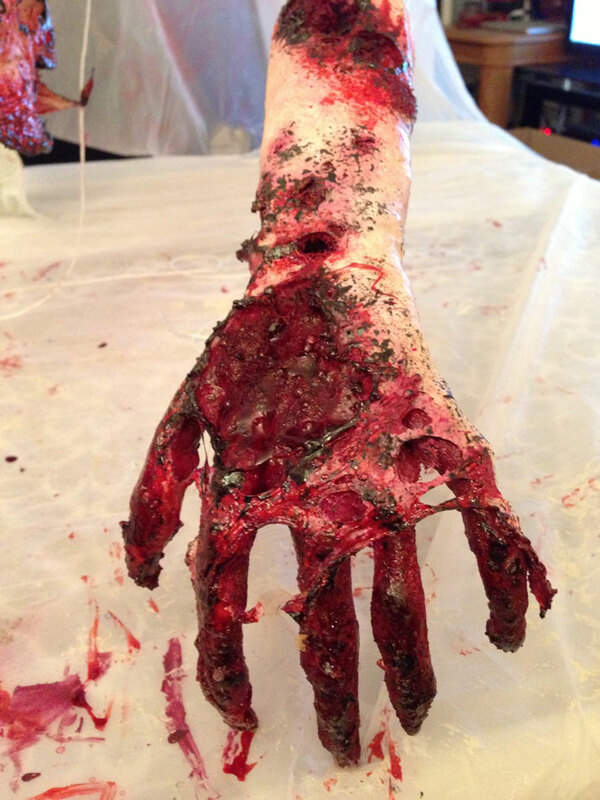 The fleshy portions of the wounds were airbrushed with red acrylic paint and coated with clear (and flexible) high gloss liquitex varnish to give them a permanent wet look. 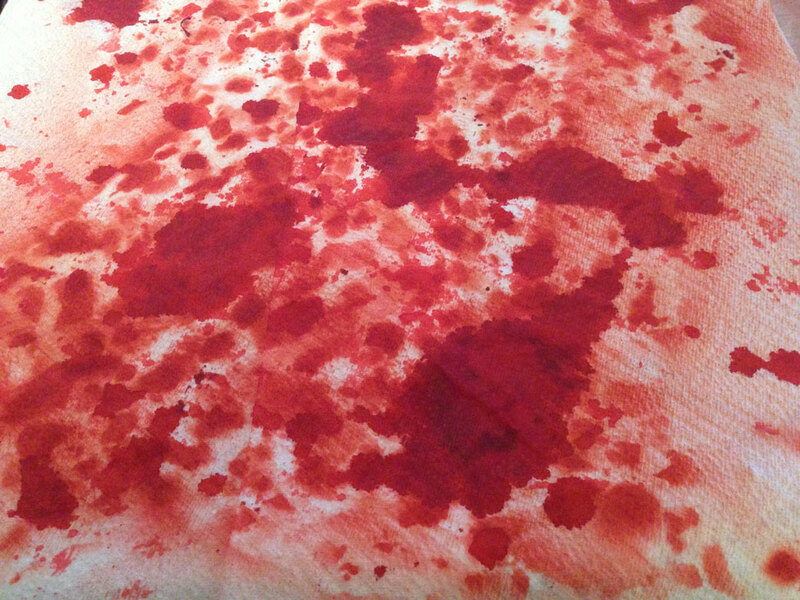 A flexible blood that maintains a wet appearance when dry was created using clear water based glue and red/green food coloring, then applied to all wounds. 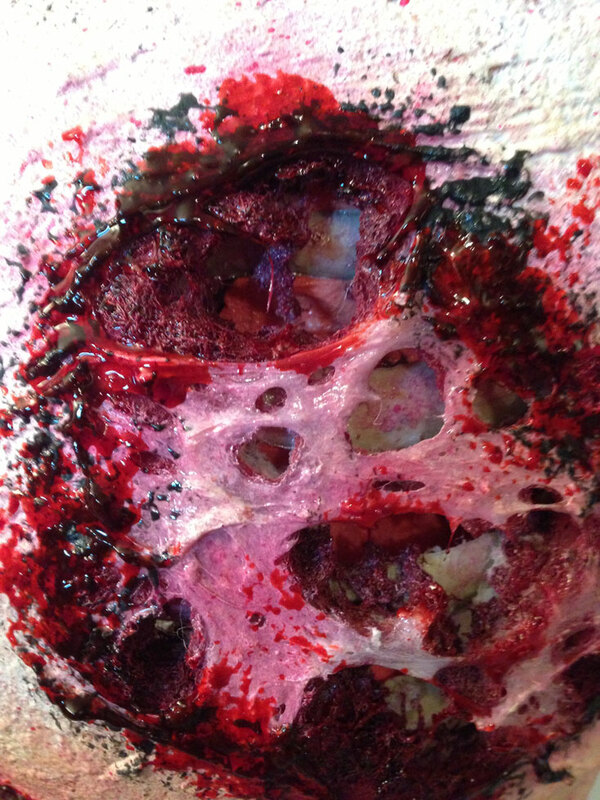 Charred tissue was created by stippling on black pigmented latex around each wound. 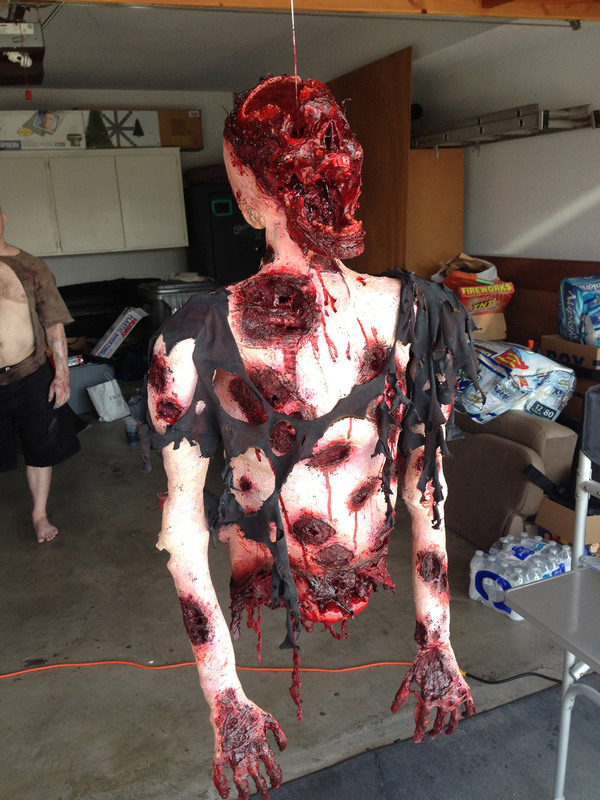 Normally we would have used more colors and added extra detail to each wound, but we were on a tight shooting schedule and that detail would not have been visible in the final shots. 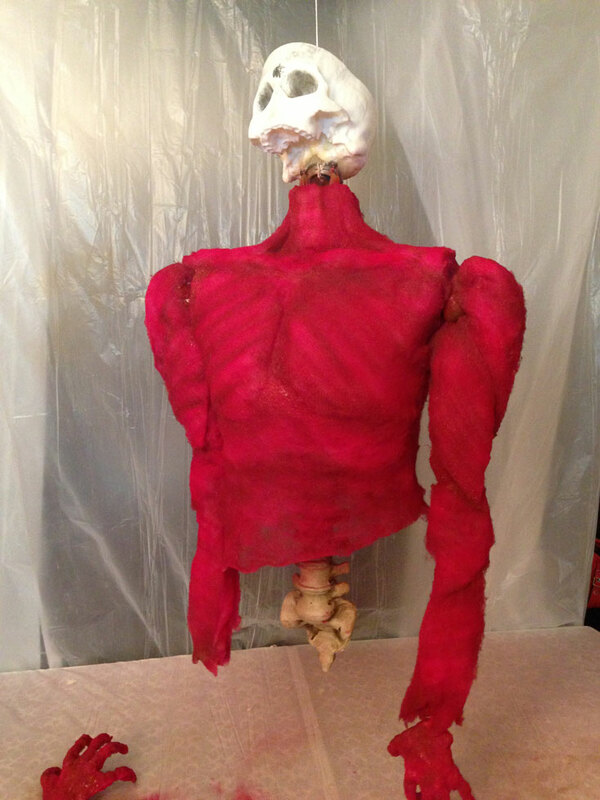 The spine was also covered in red pigmented latex for texture, and coated with the same drying blood mixture that was used on the wounds. 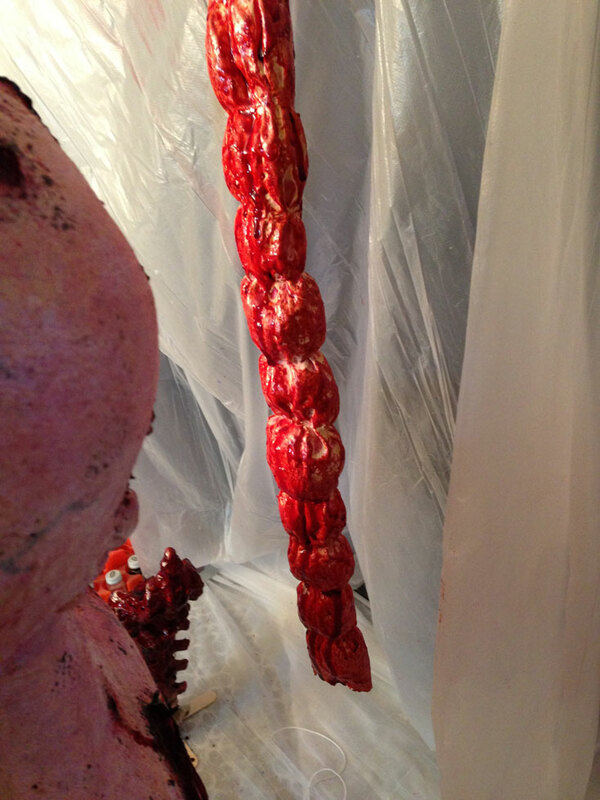 To create intestines we applied liquid latex to a large glass surface in long strips. 6-8 thin layers were built up, allowing each layer to dry before applying the next. Along those strips we placed cotton balls that were spaced out to create a lobed appearance. 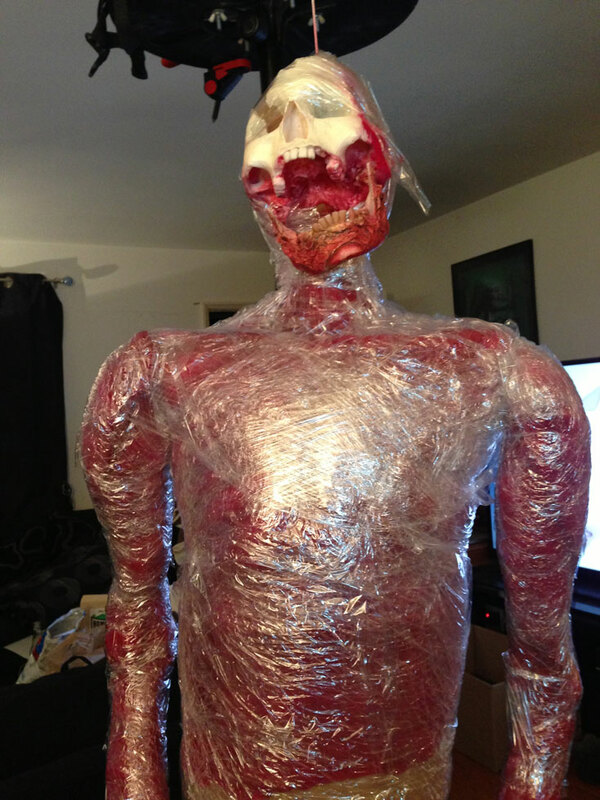 The strips were then rolled up like a burrito and sealed with a final layer of flesh pigmented latex. 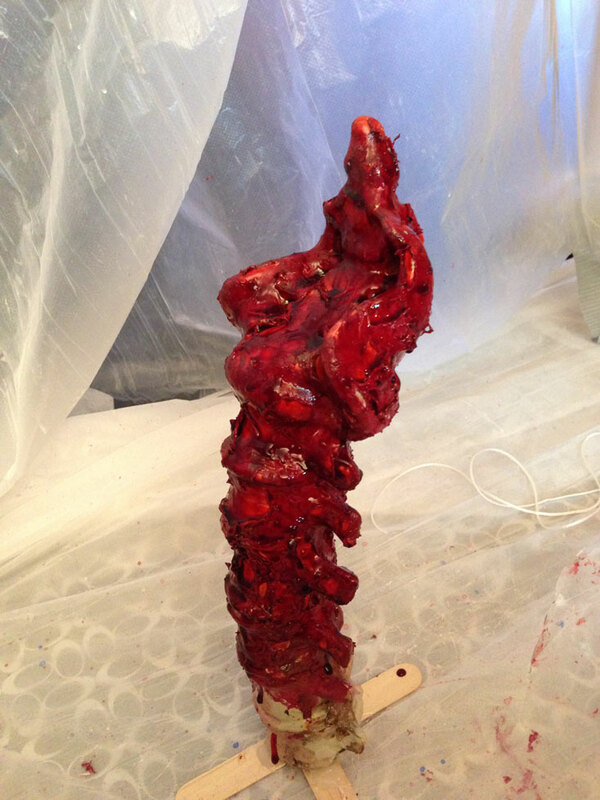 The intestines were then coated in our drying blood mixture. 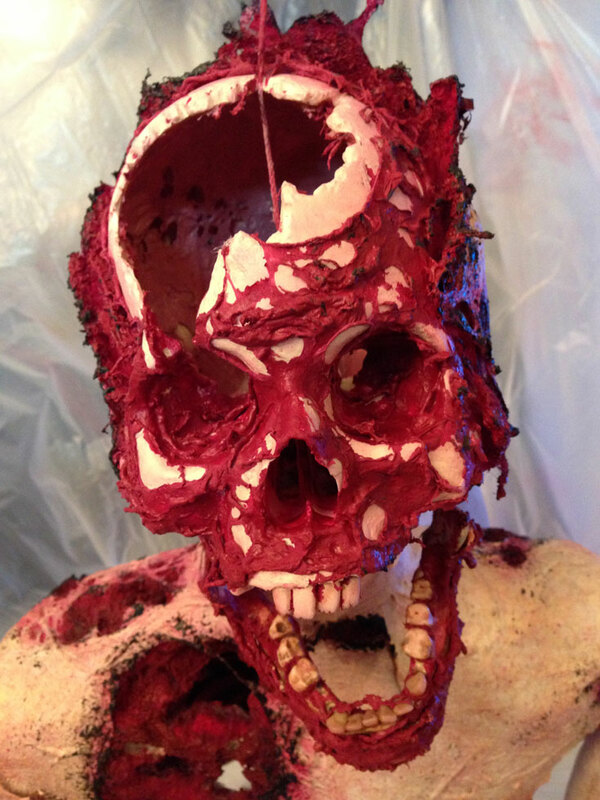 Our drying blood mixture was also drizzled onto the brain matter and brushed onto the skull. 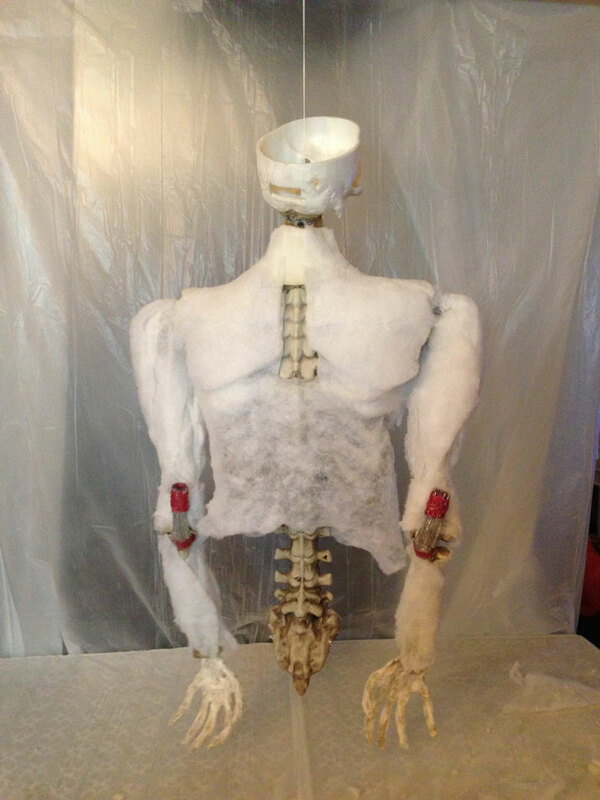 To finish off the puppet we attached small latex nurnies around the base of the torso and in some of the wounds with CA glue (aka super glue). 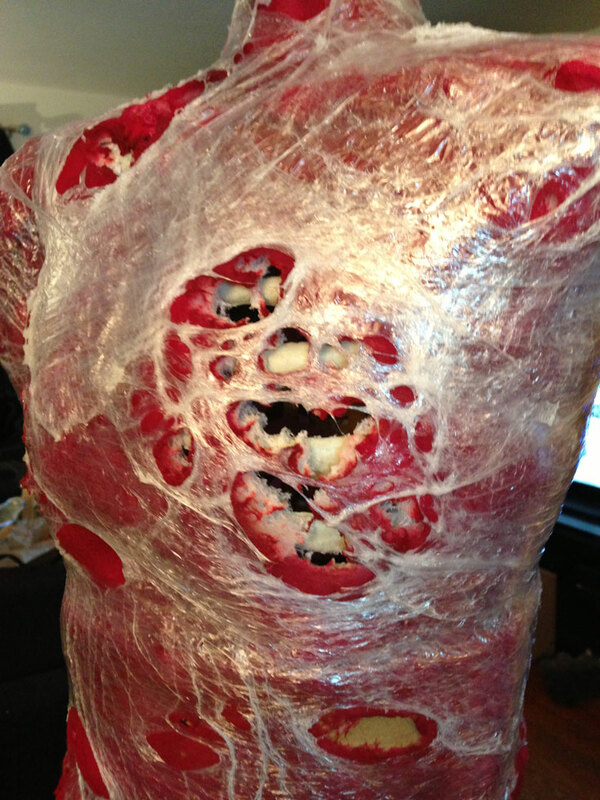 In the effects world nurnies are gnarled pieces of latex created by stippling layers of latex onto a large smooth surface in a sheet, varying sizes of holes are then rubbed in the latex sheet before it is powdered and peeled up. 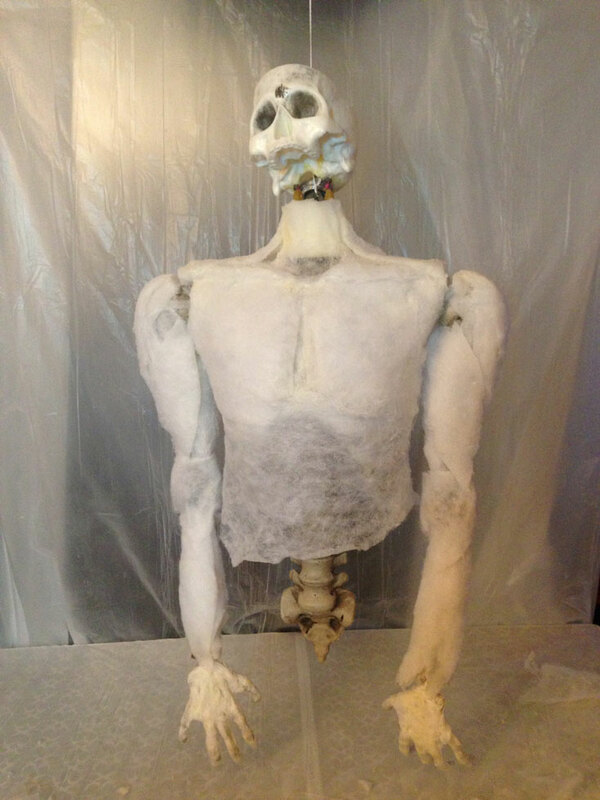 Finally, here is a shot of the finished puppet on location with some wardrobe and ready to fly to set.